Synopsis: Hilarious new series from Queen of Teen – laugh your tights off at the (VERY) amateur dramatic antics of Talullah and her bonkers mates. Boys, snogging and bad acting guaranteed! Picture the scene: Dother Hall performing arts college somewhere Up North, surrounded by rolling dales, bearded cheesemaking villagers (male and female) and wildlife of the squirrely-type. cos it’s the THEATRE dahling, the theatre!! Wow. I don’t even really know what to say about this book. The word ‘bizarre’ comes to mind. I don’t like writing negative reviews, and it’s not that this would be a negative one per se, it’s just that this book wasn’t really for me. I enjoy silly books, but this one was silly to the point of being pointless. Things I did enjoy: Ruby - she was a great, funny little sidekick. The Yorkshire way of speaking - it took some getting used to, but it made me laugh. The owls - I love owls. The twins - I laughed hysterically at some of the things they said. If I wasn’t so easily amused, I don’t think I could have finished this book. I honestly don’t understand what the point of it was, hence such a short review. There’s just really not that much to say. Note: If it wasn’t for the fact that I repeatedly laughed myself silly over the stupidity in this book, I would give it two stars, but because it made me laugh so much, and I love to laugh, I’m giving it three stars. 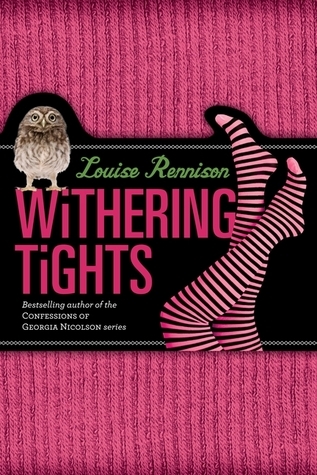 Have you read Withering Tights? What did you think?